UPDATE: The survey is now closed. Thank you to everyone who submitted feedback! Note: If you are subscribed to my newsletter, you should have already received this message. If you’re not subscribed, you can do so by going here. Hi friends! Here in Los Angeles, the season is slowly starting to turn towards fall. It’s a subtle shift here in southern California but after over a decade here I’ve come to recognize the signs. The nights and early mornings become cooler than in the summer and there’s a very slightly crispness to the air. We even had our first rain and thunderstorm this weekend. The change of seasons also signals that it’s almost time for my birthday. It’s a big one this year. Thirty-nine! And while I’m not freaking out per se, I am thinking about life, what makes me happy and where I want to be going in the next year. One of the things I know for sure is that I love sewing and making and being a part of the online sewing community. So as I start to plan for next year and make goals, I’d first like to get some feedback from you. I’d like to hear a little bit about your interests and needs and what you’d like to see from Sew DIY in the future. I put together a survey right here and I’d be so grateful if you take the time to fill it out. The survey is completely anonymous and you can skip any question. Also if you ever want to get in touch with me, just email me at sewdiyblog (@) gmail.com. I love to hear from people. For the first 7 months of the year, my sewing queue was pretty focused on making things for my trips to Denmark and Hawaii. Now that the trips are done I’m ready to refocus on my everyday wardrobe. 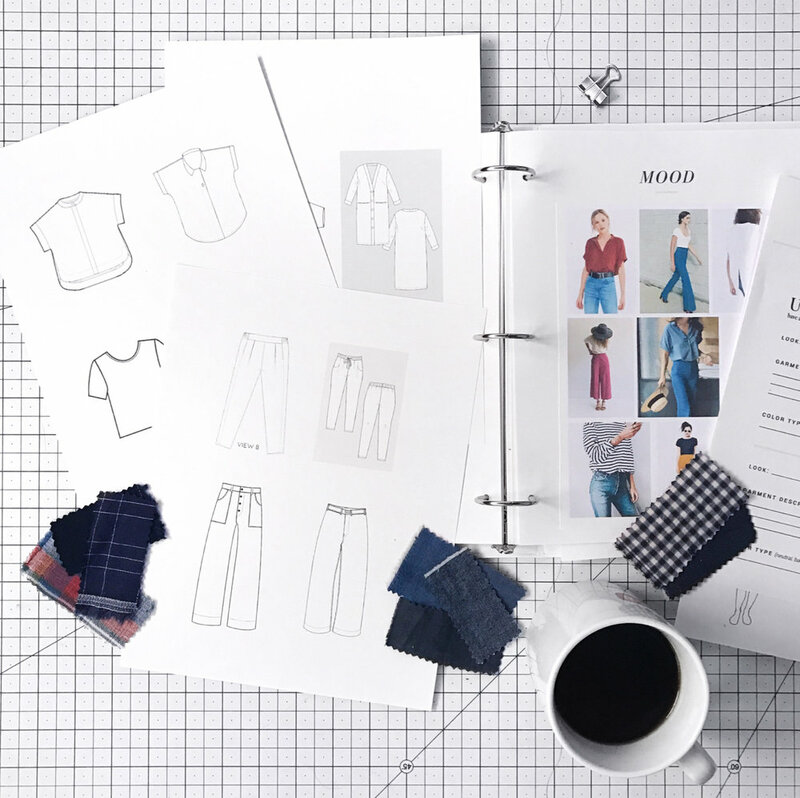 I participated in the Seamwork Design Your Wardrobe program earlier this year. It really helped me determine what styles I gravitate towards and need to add to my wardrobe. I’ve had a list of patterns and a huge pile of fabric just waiting for me to job back in and start sewing. But with such a big list and limited time (I’m planning to release a new pattern very soon!) it’s hard to decide where to start. I recently heard about the #SeasonalSew3 idea that was started by the gals at Sew Altered Style. It’s like the Make 9 but it’s for a shorter period of time. I really like the idea because I find myself often changing my mind a few months into the year and not making half of what’s on my list. So I’ve selected 3 pieces as my top goal (numbers 1-3 in the list below) and have a few more to round out the inspiration queue. I actually did a muslin of these months ago and then set them aside to focus on sewing for Hawaii. The pattern still needs an adjustment or two but I’m not starting at zero. I’d also love to try the Persephone Pants by Anna Allen Clothing but will force myself to focus for the moment. :) When the Fabric Store closed earlier this year, I picked up a lot of pants fabric so I think I already have some good options in my stash. I love wearing cardigans and I’m excited to try out this pattern. I’m going to be making this as a collaboration with StyleMaker Fabrics so it is guaranteed to be made soon and to be fabulous. This pattern looks like such a classic, just the kind of thing that I’d wear everyday. This is another one I’ve started and want to finish. I think the design is really unique and cool and I’m curious how it would turn out. I’ve cut out the pattern and attempted a tissue fitting. The pattern pieces are currently a jumble in the closet but I’d still love to give it a go. I’m definitely on the fence about the faux skirt wrap. It takes a lot of fabric and may look weird. I love the design of these pants and bought the pattern a few months ago. On work days, pants are my go-to and I’d love to add another style to my rotation. I made a Kalle dress earlier this year and I’d love to have to crop to wear with high waisted jeans. I think it would make a great wardrobe staple. I have both of these patterns and I’d really like to try the Willamette again in a more drapey fabric. These are on my Make 9 list. I love the cross over back design of the dress. And the Mito is perfect to layer underneath. I have copy shop versions printed of these patterns and fabric in the stash so it’s just a matter of queue and time. JEANS. I wear jeans all the time and my RTW pairs are really starting to show some wear in the tush. I’ve only made one pair before and would love to give the Gingers a go. I enjoy wearing both flare and skinny styles so I love the options with this pattern. Again, I have the copy shop version printed and fabric on hand. This pattern is kind of my dream pattern. It’s so beautiful and elegant (maybe a little too much for work wear) but I think this is a piece that I’d be really proud of making. It’s outside of my usual repertoire and I think could be challenging in a good way. Also I've never made a Victory pattern before and it would be really fun to try out a new-to-me designer. Have you started planning your fall sewing yet? Anyone else have a hard time narrowing down their sewing lists?